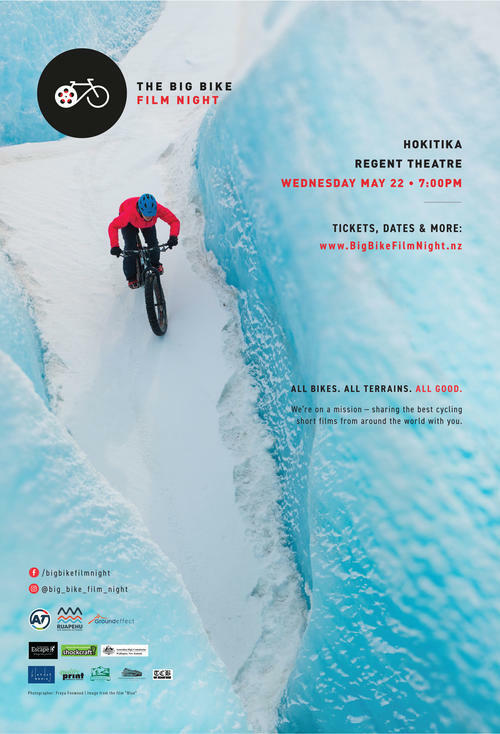 The 5th annual Big Bike Film Night, sees us get bigger, better and riding down the West Coast and into Hokitika to entertain pedal punters. Screening on Wednesday 22nd May 2019 at one of the country’s best little Cinemas Hokitika’s Regent Theatre. Our Evening Screening sees the doors open at 6:30pm and kicks off at 7.00pm. Prepare to be inspired! The Big Bike Film Night is on a mission sharing the best cycling short films from around the world with you. Showcasing our 2019 collection that has everything a cycling-centric audience could want- action, drama, humour, and plenty of inspiration; the evening is going to be unashamedly, unequivocally, and utterly Bike-alicious! Our treasure chest of stories includes... a spectacle of winter with the icy playground providing a visual journey as never seen before by bike; a fixie rider who commits a crime of passion; five friends with disabilities attempting a world first human powered ride from Kati Thanda-Lake Eyre 2150km to Mount Kosciuszko in Australia (what could possibly go wrong? ); a New Zealander who has a two wheel love story to share; a heart-warming documentary about a ‘community mother’ who runs a bicycle training program for migrant and refugee women in Amsterdam; and two pioneering mountain bikers undertaking an adventure in wild and unknown landscapes, riding only horse trails, in heartland Africa; ALL in the mix!! These short films are a great reminder of why we love to ride our bike; with stories that captivate us, stories that make us think, and most importantly of all- stories that inspire us to get out and ride. Tales of character, resilience, challenge, courage, triumphs over adversity and much much more. So...listen to the voice inside you; it’s telling you to go. Grab your mates, get your tickets - GO ON… grab your bike and come along for the ride! !